Is there such a thing as bathing addiction? If so, does anyone know of a treatment program, preferably one at a center with showers only? I think Boots is going to need help some day. Possibly some day soon, if only I could get him out of the tub. Hard to believe how much he hated his bath when he was a babe. No matter how careful I was to minimize exposure, he’d howl the second air hit the tiniest swath of skin. I’d do a quick swab before turning him back into a human burrito, and all became right in his world again. But then one day his hand finally dangled so dangerously close to the water that he accidentally splashed. Wow! This bath gig’s not so bad after all. Nearly four years later, the splashing has only intensified, which is too bad for the walls and carpet. It’s great for my productivity in the mornings, though. We have a strange house: Both my computer and a bath tub are in my bedroom. The computer’s getting creaky but the tub’s a beaut, virtually the equivalent of an Olympic-size pool for someone of Boots’ stature. So as soon as he gets bored with painting, Wubbzy, stickers and repeated denials of requests to listen to the Thomas rap on YouTube, he starts begging for a trip to water world. I feed his addiction, happily providing bubbles, a collection of a dozen empty bubble-bath bottles too precious to toss, plastic dishes and shaving cream spiked with food coloring. To think of all the money I used to waste on rubber ducks and bath paint. He’ll stay there until pruned skin and goose bumps force him out. In the evening, though, the pleas start again. Both guys were born under water signs, so I suppose the addiction was inevitable. Still, I worry about the long-term ramifications. Am I raising someone who will refuse to remove the surgical gloves as an adult? 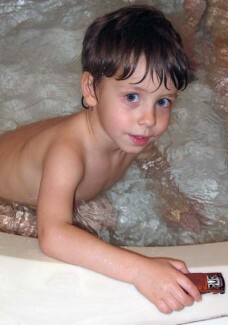 A future businessman who will have to have an in-office Jacuzzi because a good soak is the answer to everything. Come to think of it, office spas are a pretty good business solution. Go ahead, Boots. Enjoy your bath. Augh, tubby time. Yes, we have that addiction around these parts too. Must be their age! LOL. Btw, is that a lighter he’s holding? Boots is very brave! OMG, it does look like a lighter! I should replace that picture before someone calls Child Protective Services. It’s actually one of their Hot Wheels, Halloween goblin edition. It’s a pretty creepy car – a rust-colored low rider with an orange wind shield, a skull on the hood and black and white flames on the side. Boots drew the short straw that day.